There are two things in this world I will never stop loving: food and schemas (sorry, husband). I’ve been a self-proclaimed pseudo-foodie for quite some time now, involving myself with the local food blogging and Yelping community to their chagrin as much as possible. Through those relationships, I’ve realized the knowledge I take for granted, including ways to market and promote a food blog. Yes, the most important part of maintaining any blog is providing high quality, high value content, but good content can’t expose itself. It needs a dash of marketing help. Here are my first page results, and I’m happy with my results so far. 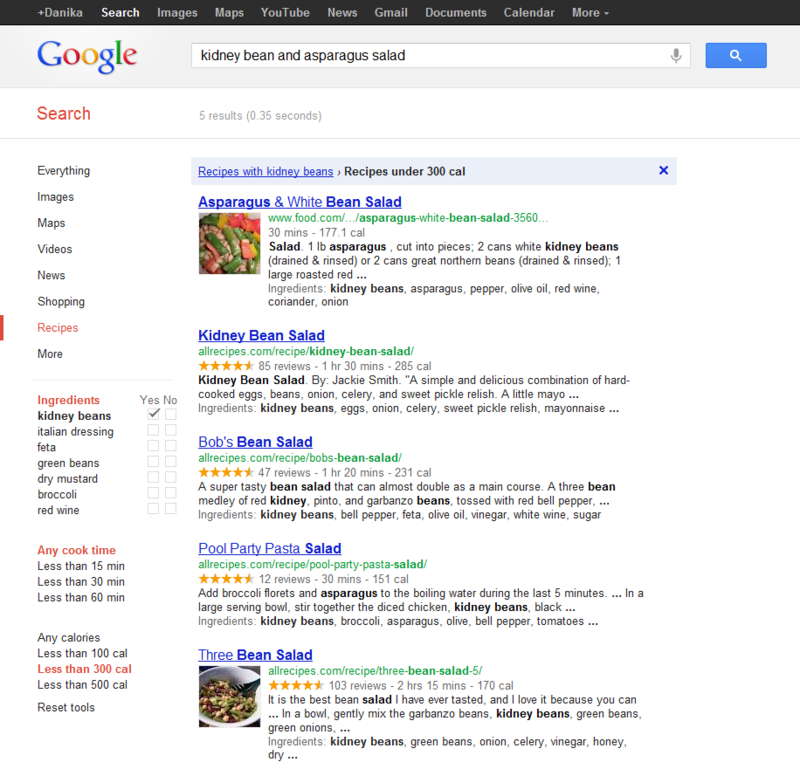 Google served me a nice mix of small food blogs and large recipe databases. I notice the search filter options on the left-hand side and decide that maybe I should narrow down my results a bit more. After all, I definitely want kidney beans, and I might want to find something under 300 calories. Gah! Where did all the food blogs go? 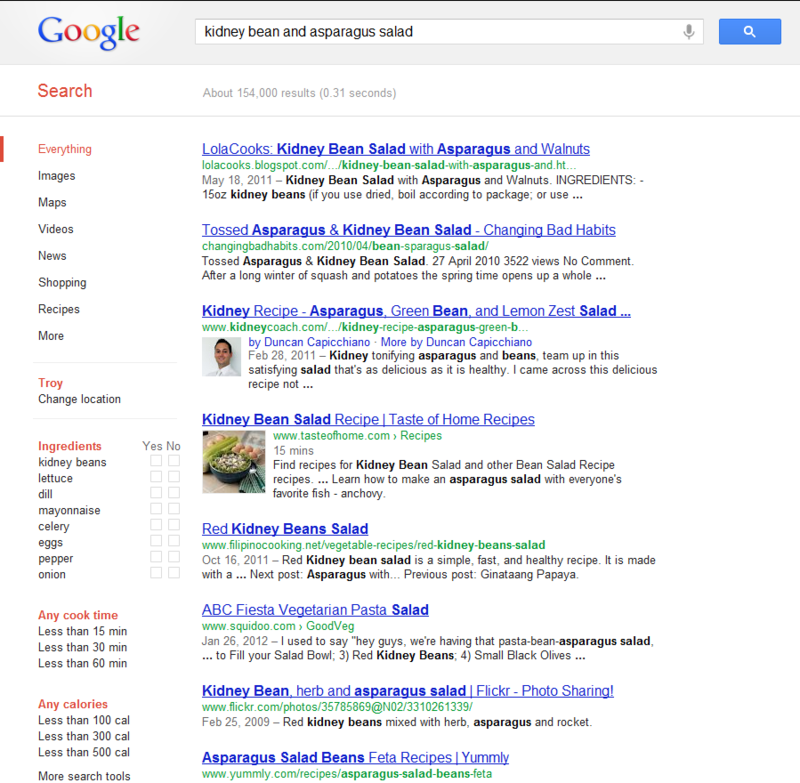 I took a quick look at the first result before I filtered my results, and LolaCooks’ kidney bean salad recipe definitely fits my criteria, so what happened? By using schemas I can get in on the filtering game so that Google and other search engines offering recipe-based filtering criteria can include me as users begin to narrow down their search. Now, let’s figure out how to use them. Local food blogger, Jen is Green, was kind enough to allow me to use one of her recipes as an example of how to implement schemas. Despite the unseasonably warm weather in the Capital Region today, a bowl of her Mom’s Secret Vegetarian Chili appeals to me. Once you publish the recipe post, use Google Webmaster Tools Rich Snippets Testing Tool to verify that you implemented schemas correctly. It will show you the fields the Google bot was able to scrape from your page and how your page would display in search results. This may all seem like gibberish to you, so feel free to plug in to these fields until you get the hang of it. Add them by hand – The simplest method. Tally the total fat, carbs, protein, and calories from each ingredient based on what’s listed on the label. Wolgram|Alpha Nutritional Information Widget – This widget can only handle up to six ingredients, but it pulls nutrition information directly from Wolfram|Alpha’s database, ensuring data accuracy. SparkRecipes Nutrition Calculator – This tool can handle more ingredients, but you must create an account for access. Once you have your nutrition information, you can plug it directly into the nutrition facts schema described above. Whatever you do, don’t be afraid of schemas. Thankfully, incorrectly using them cannot damage your rankings. However, successful implementation can only help, and will ensure your recipes stay in the running as users begin filtering their recipe results.